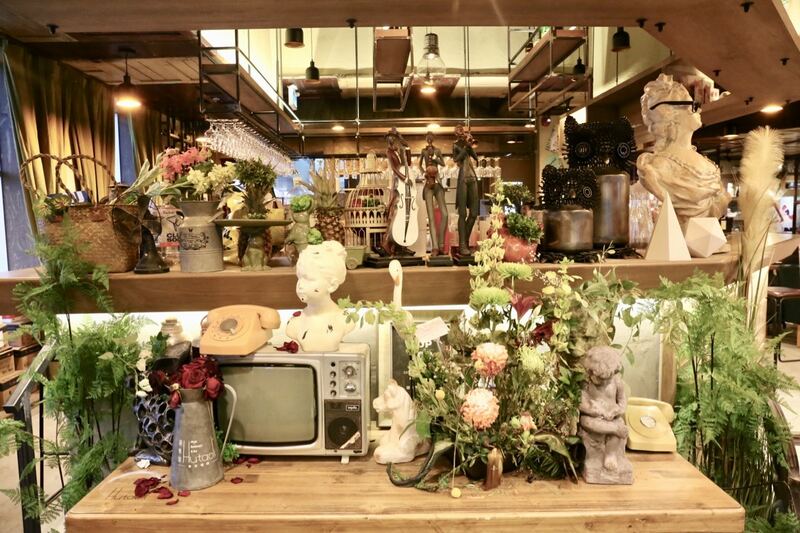 Whimsical vintage garden interior design at Hutaoli Toronto. 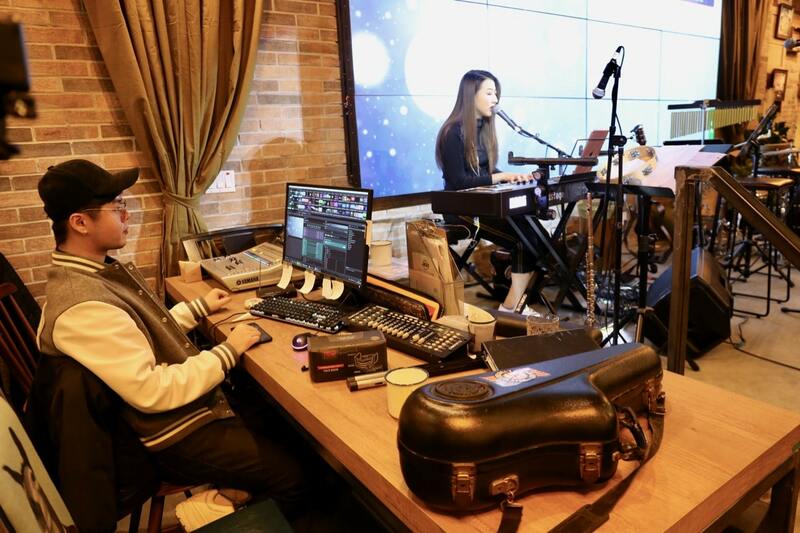 Hutaoli Music Restaurant & Bar is China’s most popular music restaurant brand. 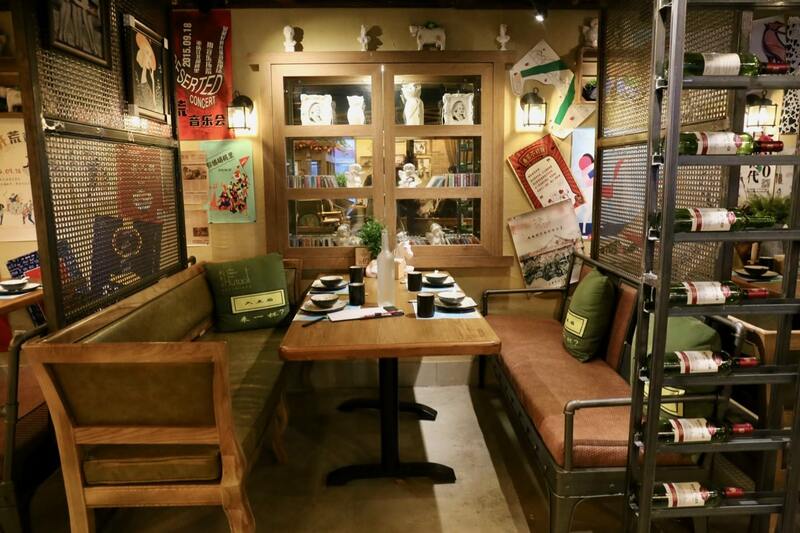 Hutaoli restaurant was first established in Shenzhen, China (just outside of Hong Kong) in 2013. The well-established brand has over 400 locations in China. After nearly two years of preparations, Hutaoli Music Restaurant was finally ready to open its first overseas location in Toronto. On March 1, 2019 Hutaoli restaurant opened its doors in Markham. The restaurants dining room is inspired by a magical garden. 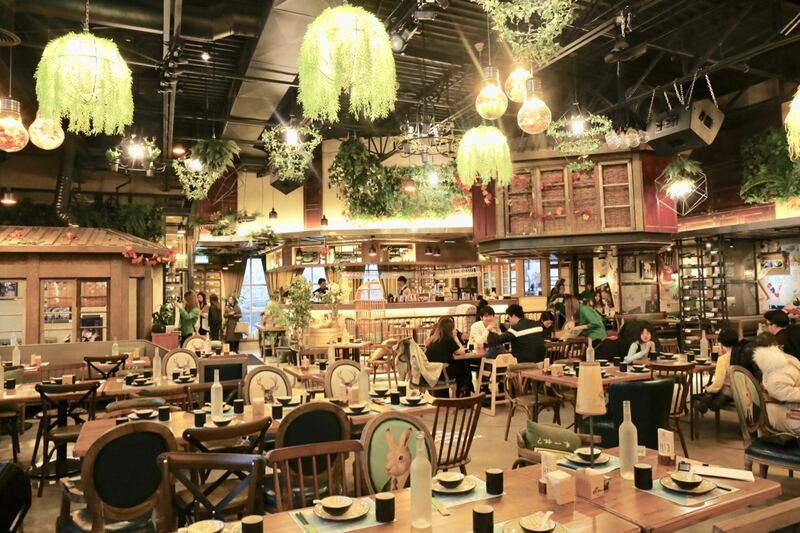 Step inside Hutaoli Chinese restaurant in Markham and you’ll find a whimsical interior design constructed by Z Square. The name Hutaoli suggests a place that is peaceful, an ideal fantasy world. Decor in the dinning room evokes an “Alice in Wonderland” vibe that eludes to a magical forest, filled with overhanging vines, backlit bonsai trees, and suspended and exposed light bulbs. Hutaoli in Markham offers a plethora of seating options, from intimate private dinning rooms, elevated cozy booths and tables up close to the live music action. An intimate booth at Hutaoli Chinese restaurant in Markham. Hutaoli Toronto’s beverage program offers plenty of libations. Wine lovers can enjoy bottles by Ontario’s own Cave Springs, Australia’s Jacob’s Creek and Leaping Horse from California. We suggest pairing those spicy Szechuan dishes with beer such as O’Hara Irish Stout, Asahi Dry, Stella Artois and Blanche de Chambly. You can also order from a list of craft cocktails, many of which are muddled with tropical Asian fruits. 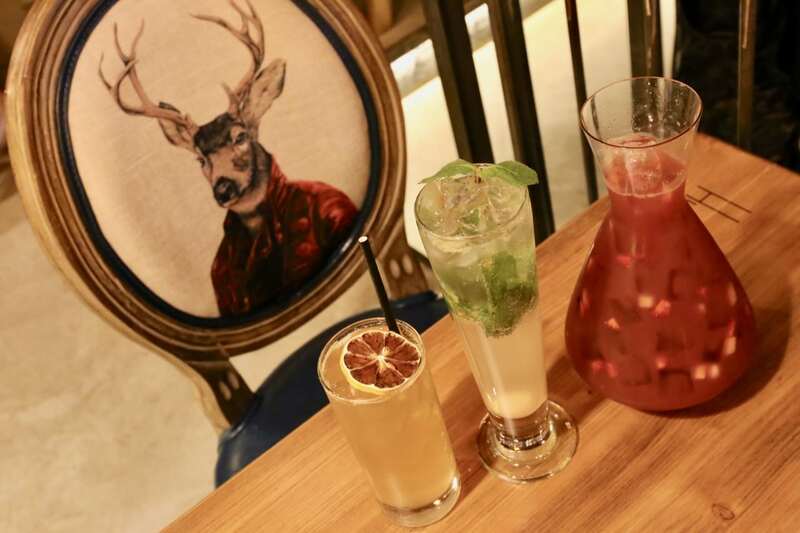 A jug of sangria and Asian tropical fruit inspired craft cocktails at Hutaoli Markham. 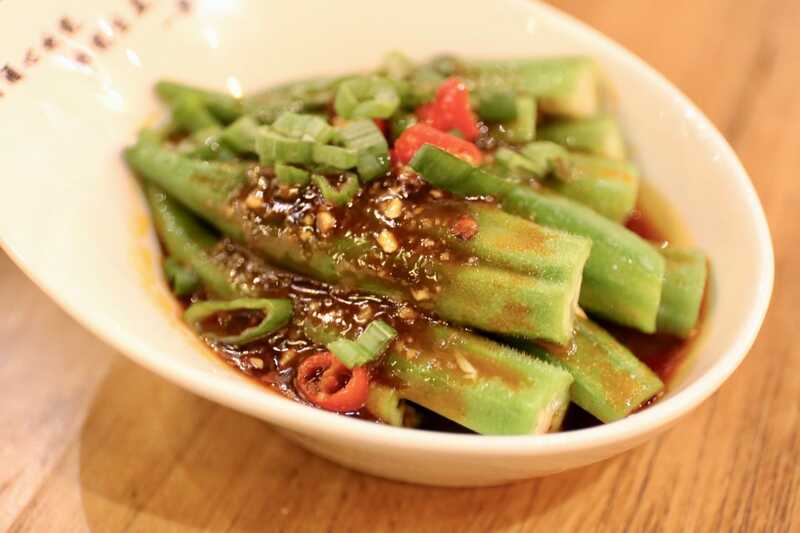 Hutaoli Toronto’s mission is to provide a full experience where guests can enjoy authentic Sichuanese dishes while enjoying an eclectic and entertaining one-of-a-kind atmosphere. Each Hutaoli location hosts live performances and engages its diners through improvised shows and interactive activities. The dinning room is built around a central stage where each night a local band performs for the crowd. There is also a massive video screen located on the brick wall behind the stage. Guests can enjoy watching Chinese music videos whenever performers are not on stage. Diners can also help celebrate birthdays, anniversaries or simply share a fun selfie with friends on the big screen by tagging their posts on Chinese social media app WeChat. Live music at Hutaoli Toronto. It’s important to note that there are two Hutaoli restaurants in Toronto. Hutaoli Music Restaurant & Bar at 3760 Highway 7 East is officially recognized by the head office in China. There is a fake Hutaoli at 2900 Warden Ave in Toronto. They have been running their business for over one year without any authorization. Buyer beware! Chef Zhang has more than 20 years of experience in the Chinese restaurant industry. Chef Zhang was born and raised in Sichuan, which is why Hutaoli Toronto’s menu specifically celebrates spicy Sichuan cuisine. Hutaoli Toronto’s signature dish, and the most ordered by customers, is the House-Special Roasted Chicken. The chef marinades the bird in a secret blend of twelve ingredients for eight hours every day. The final dish is served to the guest on a plate inside a birdcage. The server then sprinkles Hutaoli’s signature peanut powder over the roast chicken and uses a wooden hammer to tenderize. 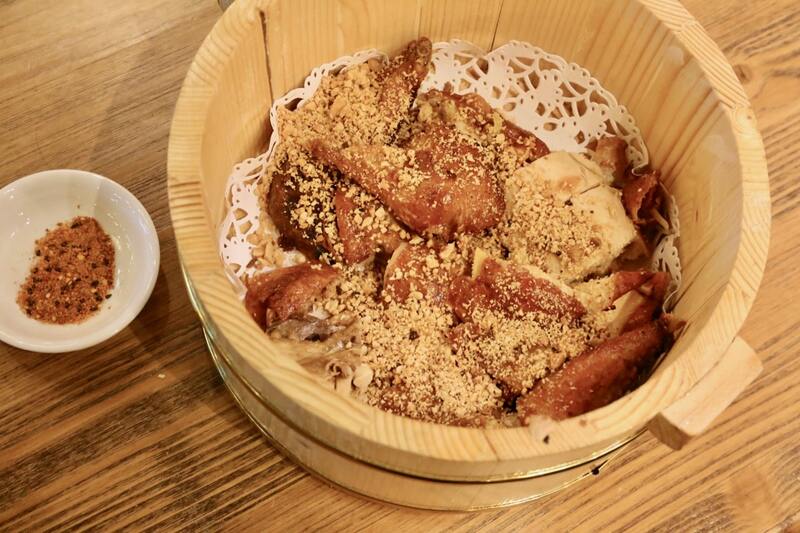 Hutaoli Markham’s signature dish is roast chicken served with roasted peanuts. We suggest visiting Hutaoli Chinese restaurant in Markham with a group of friends so you can sample and share a selection of dishes while enjoying the restaurants live music and entertainment. 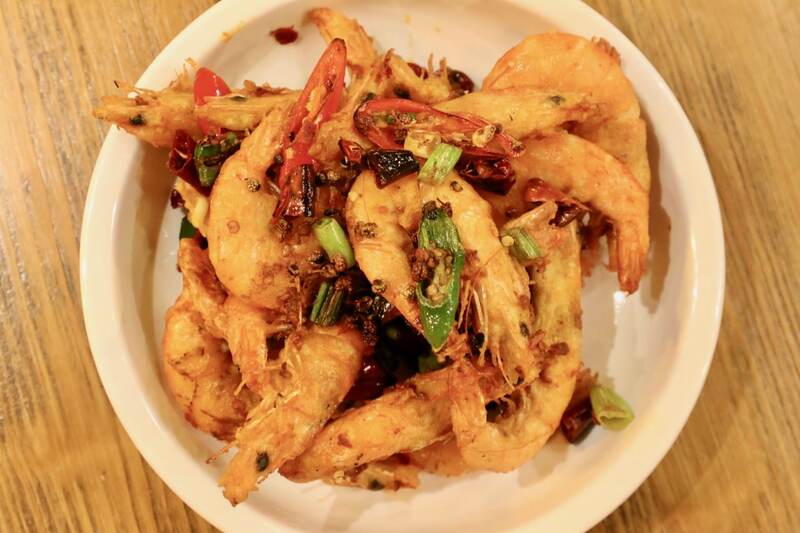 Spicy Stir-fried Shrimp is a popular dish on the Hutaoli Toronto menu. Our favourite chef’s specials at Hutaoli Markham are soft Mapo Tofua and a perfectly roasted Sichuan-style Smoked Duck. 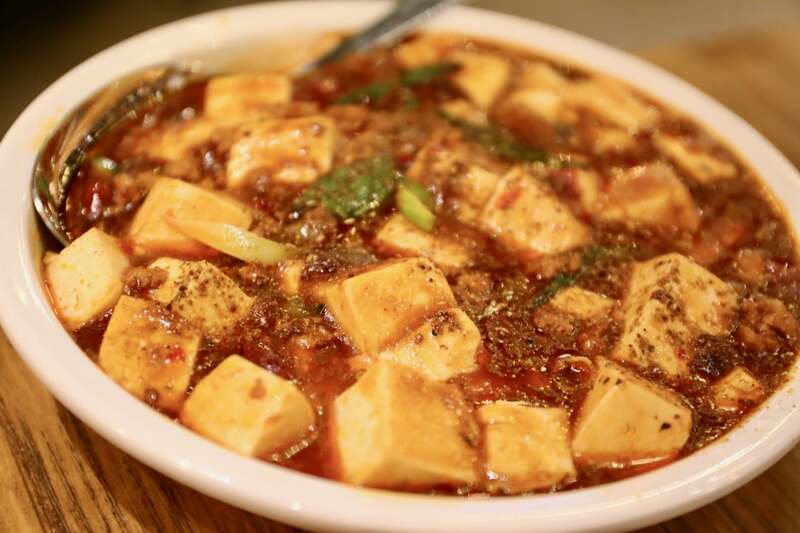 Mapo Tofu at Hutaoli restaurant in Markham. Sichuan Style Smoked Duck at Hutaoli Toronto. 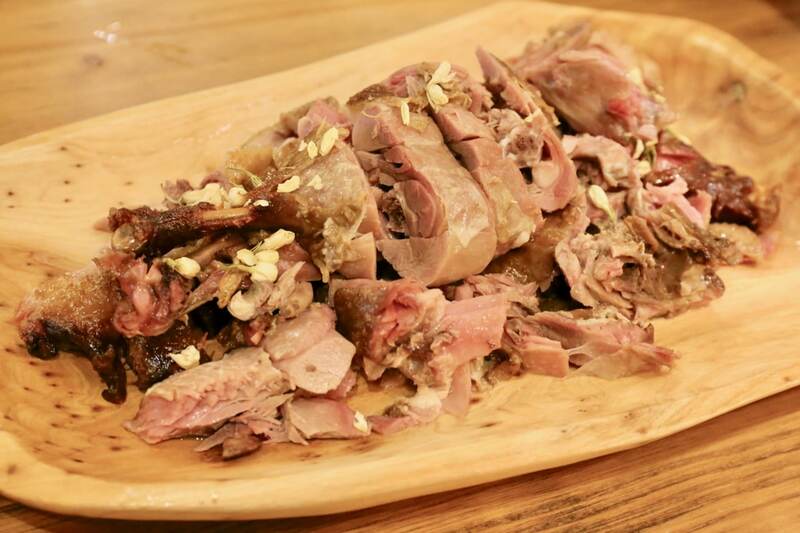 Sample authentic Chinese dishes at Hutaoli restaurant in Markham such as surf clams, duck gizzards and chicken feet. 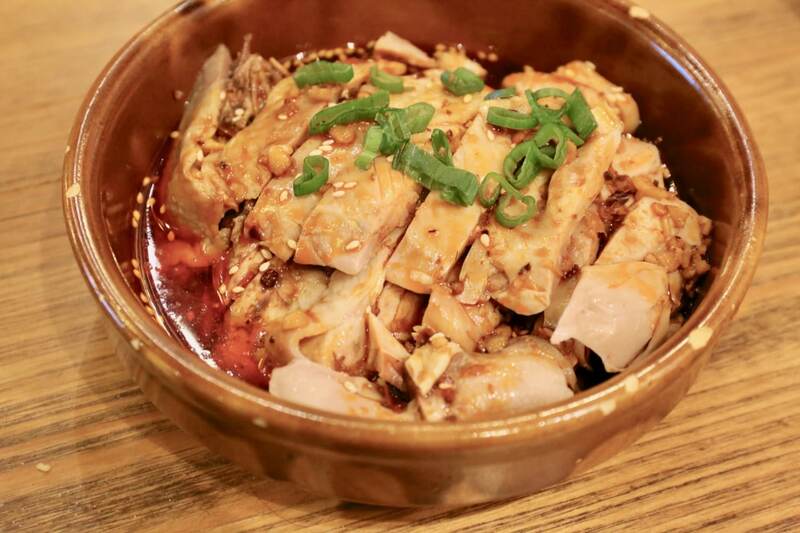 Steamed Chicken with Chili Sauce at Hutaoli restaurant. Meat lovers will enjoy Hutaoli’s Kung Pao Chicken, Fried Ribs with Peppers and Garlic, and Braised Pork. One of the vegetarian dishes at Hutaoli restaurant arrives to the table topped with Chinese bacon. You may want to specify with your server if you are vegetarian or vegan to ensure you’re meal is actually meat-free. 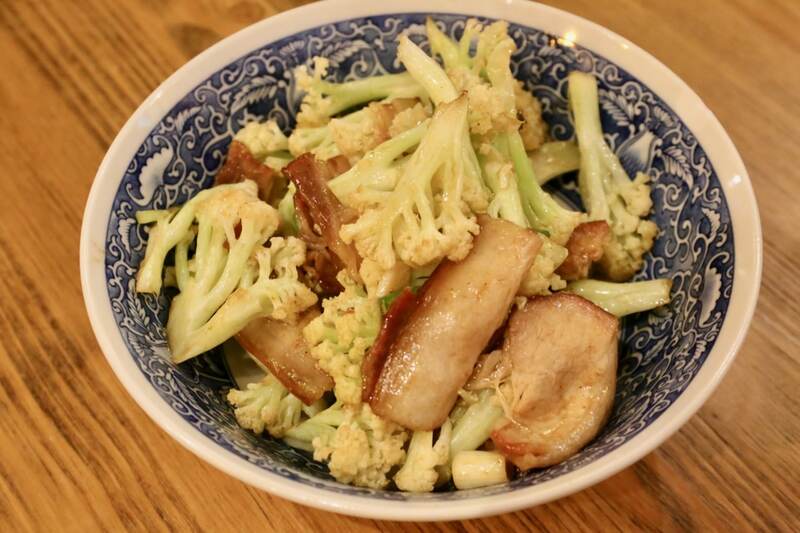 Fried Cauliflower with Chinese Bacon at Hutaoli Chinese restaurant in Markham. 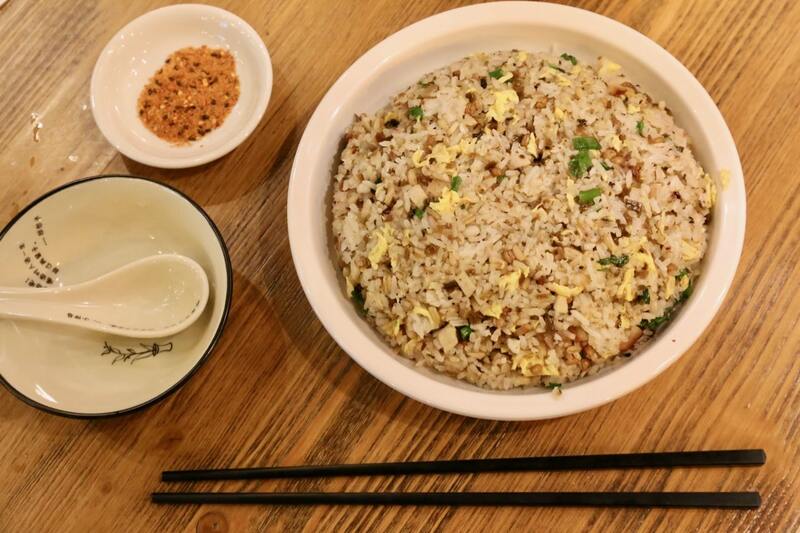 Hutaoli Markham’s fried rice and Durian pizza are the most popular carbs on the menu. Country-style Fried Rice with Chinese Bacon at Hutaoli restaurant in Markham. 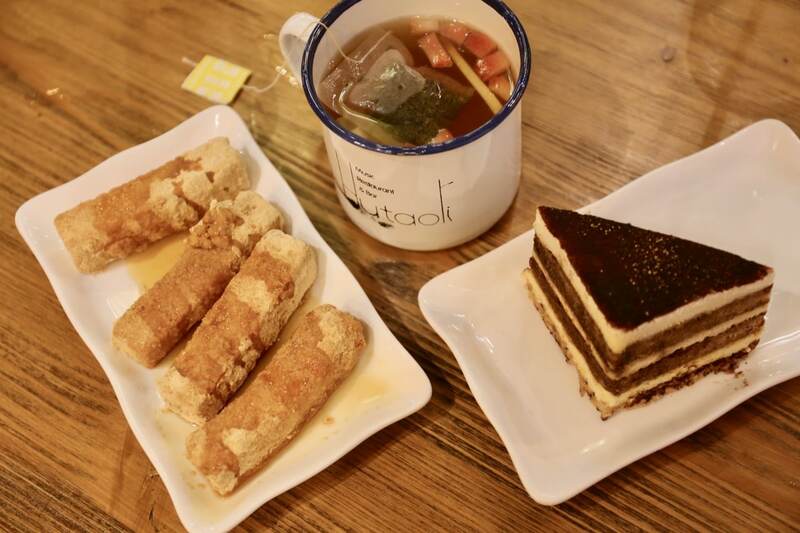 Popular desserts at Hutaoli restaurant in Markham include Brown Sugar Crispy Rice Cake and creamy Tiramisu. Brown Sugar Crispy Rice Cake and Tiramisu are popular desserts.